Amazon announces popular apps supported by the Kindle Fire | Android Blast! The Amazon Kindle Fire will not support all Android apps, but Amazon wants you to know that it will support most of the popular apps. The company issued the following press release announcing support for Facebook, Pandora, Rhapsody, and games from Electronic Arts, Zynga, and Rovio among others. SEATTLE - November 9, 2011 (NASDAQ: AMZN) - When Kindle Fire customers across the country open their boxes next week, they will be able to choose from several thousand of the most popular Android apps and games, including Netflix, Rhapsody, Pandora, Twitter, Comics by comiXology, Facebook, The Weather Channel and popular games from Zynga, EA, Gameloft, PopCap and Rovio. Kindle Fire customers will be able to download these apps and games without having to register multiple times and using Amazon�s simple and secure 1-Click payment technology. Plus, all apps are Amazon-tested on Kindle Fire for the best experience possible, customers can get a great "paid" app for free every day, and once you�ve downloaded an app from the Amazon Appstore, it�s available on Kindle Fire as well as your other Android-based devices. "We started talking to app developers everywhere the day we introduced Kindle Fire, and the response has been overwhelming," Dave Limp, Vice President, Amazon Kindle. "In addition to over 18 million movies, TV shows, songs, books, and magazines from Amazon, we are excited to offer customers thousands of apps and games to choose from on Kindle Fire - from Pandora and Rhapsody to Facebook and Twitter to Netflix, as well as popular games from EA, Zynga and many other top game developers. And this is only the beginning - we�re adding more apps and games every day across all categories." With the Netflix app, Kindle Fire customers who are Netflix members can browse and instantly watch unlimited TV shows and movies and resume watching where they left off on their TV or computer. "We�re excited to team up with Amazon to give what we think will be a huge community of Kindle Fire owners the opportunity experience all that Netflix has to offer," said Bill Holmes, Vice President of Business Development at Netflix. "We�re certain that our members will have a great viewing experience on Kindle Fire." "EA is proud to be part of Kindle Fire," said Bernard Kim, Senior Vice President & Head of Global Sales and Marketing at Electronic Arts. "On Kindle Fire, we�re offering some of the world�s most popular titles with incredible gameplay and breathtaking graphics that anyone can play and enjoy anytime, anywhere." �We�re excited to be bringing our massively popular games to Kindle Fire,� said Andrew Stein, Director of Mobile Product Management at PopCap Games. "Kindle Fire is a great gaming device, and consumers will love the touch-screen optimized adaptations of top titles such as Plants vs. Zombies." "Personalized radio has the power to enhance all types of experiences anytime, anywhere and we�re thrilled that Pandora is a launch app on the new Kindle Fire," said Jessica Steel, Executive Vice President of Business and Corporate Development at Pandora. Allrecipes, Bloomberg, Cut the Rope, Doodle Fit, Doodle Jump, Fruit Ninja, Jenga, LinkedIn, Zillow, Airport Mania, Battleheart, Pulse, The Cat in the Hat, Quickoffice Pro, Jamie�s 20-Minute Meals, IMDb Movies & TV, and Monkey Preschool Lunchbox. Kindle Fire offers more than 18 million movies, TV shows, songs, books, magazines, apps and games, as well as free storage in the Amazon Cloud, Whispersync for books and movies, a 14.6 ounce design that�s easy to hold with one hand, a vibrant color touch screen, a powerful dual-core processor and Amazon Silk - Amazon�s new revolutionary web browser that accelerates the power of the mobile device by using the computing speed and power of the Amazon Web Services Cloud - all for only $199. Customers also enjoy a free month of Amazon Prime, providing access to Prime Instant Video with 13,000 movies and TV shows available for unlimited streaming and the new Kindle Owners� Lending Library where Kindle owners can now choose from thousands of books to borrow for free including more than 100 current and former New York Times Bestsellers - as frequently as a book a month, with no due dates. Customers in the U.S. can pre-order Kindle Fire at www.amazon.com/kindlefire and it ships November 15. 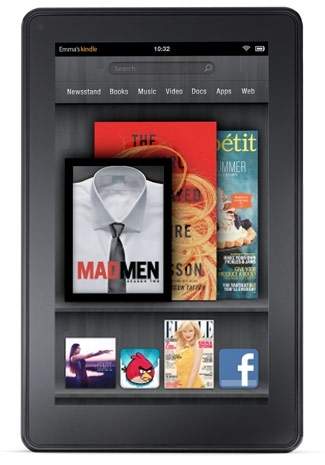 For high resolution images and video of the all-new Kindle Fire, visit www.amazon.com/pr/kindle. Amazon.com, Inc. (NASDAQ: AMZN), a Fortune 500 company based in Seattle, opened on the World Wide Web in July 1995 and today offers Earth�s Biggest Selection. Amazon.com, Inc. seeks to be Earth�s most customer-centric company, where customers can find and discover anything they might want to buy online, and endeavors to offer its customers the lowest possible prices. Amazon.com and other sellers offer millions of unique new, refurbished and used items in categories such as Books; Movies, Music & Games; Digital Downloads; Electronics & Computers; Home & Garden; Toys, Kids & Baby; Grocery; Apparel, Shoes & Jewelry; Health & Beauty; Sports & Outdoors; and Tools, Auto & Industrial. Amazon Web Services provides Amazon�s developer customers with access to in-the-cloud infrastructure services based on Amazon�s own back-end technology platform, which developers can use to enable virtually any type of business. The new latest generation Kindle is the lightest, most compact Kindle ever and features the same 6-inch, most advanced electronic ink display that reads like real paper even in bright sunlight. Kindle Touch is a new addition to the Kindle family with an easy-to-use touch screen that makes it easier than ever to turn pages, search, shop, and take notes - still with all the benefits of the most advanced electronic ink display. Kindle Touch 3G is the top of the line e-reader and offers the same new design and features of Kindle Touch, with the unparalleled added convenience of free 3G. Kindle Fire is the Kindle for movies, TV shows, music, books, magazines, apps, games and web browsing with all the content, free storage in the Amazon Cloud, Whispersync, Amazon Silk (Amazon�s new revolutionary cloud-accelerated web browser), vibrant color touch screen, and powerful dual-core processor. Amazon and its affiliates operate websites, including www.amazon.com, www.amazon.co.uk, www.amazon.de,www.amazon.co.jp, www.amazon.fr, www.amazon.ca, www.amazon.cn, www.amazon.it, and www.amazon.es. As used herein, "Amazon.com," "we," "our" and similar terms include Amazon.com, Inc., and its subsidiaries, unless the context indicates otherwise.